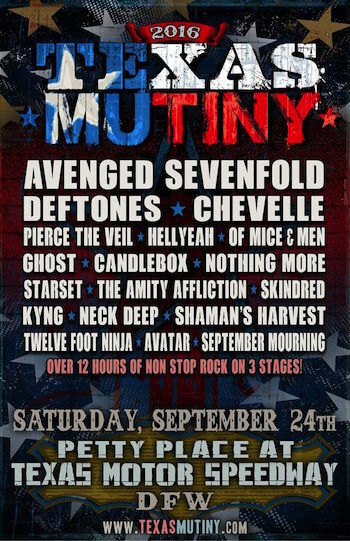 AEG Live—producers of many of the most compelling rock festivals in the U.S., including Rock On The Range, Monster Energy Carolina Rebellion, Rocklahoma and River City Rockfest—have announced the first annual Texas Mutiny festival, to be held Saturday, September 24 on the outer grounds at Texas Motor Speedway in Dallas-Fort Worth, TX. "AEG Live is one of the premier producers of rock festivals in the U.S., and we're pleased to partner with them on one that reaches the hard rock audience," Texas Motor Speedway President Eddie Gossage said. "Charlotte Motor Speedway, our sister venue in the Speedway Motorsports, Inc. family, has partnered with AEG Live for the Carolina Rebellion music festival since 2013 and we're looking forward to hosting an equally successful event in the inaugural Texas Mutiny." Specially priced Texas Mutiny presale General Admission and VIP tickets will be available from Wednesday, May 4 at 10:00 AM CDT through Friday, May 6 at 9:59 AM CDT at www.TexasMutiny.com. Visit the Texas Mutiny social media pages for a password to purchase presale tickets. Fans are encouraged to buy early and save, since ticket prices will increase at the public on-sale on Friday, May 6 at 10:00 AM CDT. Hotel and Camping Packages will also be available for purchase starting May 4. Hotel packages will include accommodations close to the festival grounds and are available for 2 or 4 people. All hotel packages include a $25 merch voucher, VIP lounge access, and commemorative poster. Camping packages are available as Basic Tent, Basic RV or Full RV Hookup for Friday and Saturday nights. VIP Camping packages include: Groupie (tent camping with $25 merch voucher, VIP lounge access, commemorative poster), Roadie (RV camping with hookup, $25 merch voucher, VIP lounge access, commemorative poster) and Rock Star (RV provided with full hookup, $250 rider, $25 merch voucher, VIP lounge access, commemorative poster). A limited number of discounted Ticket 4-Packs will also be available for active military through Texas Mutiny partner GovX (www.govx.com). Texas Mutiny is produced by AEG Live, the live-entertainment division of Los Angeles-based AEG, which is dedicated to all aspects of live contemporary music performance. AEG Live is comprised of touring, festival, broadcast, merchandise and special event divisions, fifteen regional offices, and owns, operates or exclusively books thirty-five state-of-the-art venues. For directions and more information on Texas Motor Speedway, visit www.TexasMotorSpeedway.com. With a crowd capacity in excess of 190,000, Texas Motor Speedway is among the largest sports stadiums in the United States and features an array of amenities, including the world's largest TV, that make it one of the premier venues in the world of sports. Known as "The Great American Speedway!," the 1.5-mile superspeedway located in Fort Worth plays host to two races in the NASCAR Sprint Cup Series, XFINITY Series and Camping World Truck Series as well as one in the Verizon IndyCar Series. The attendances for the NASCAR Sprint Cup events since the facility opened in 1997 annually rank among the nation's largest sporting events and also are the largest-attended, single-day sporting events in Texas. Since opening, Texas Motor Speedway has had an annual economic impact of approximately $300 million to the North Texas region. Texas Motor Speedway is owned and operated by Speedway Motorsports, Inc., a publicly traded company that is a leading marketer and promoter of motorsports entertainment in the United States. For more information, please visit www.texasmotorspeedway.com.